Where Can One Buy the Best Compound Bow? Archery is hugely popular nowadays. The increased visibility of bows can be seen in blockbuster movies like Hunger Games, Avengers and TV shows like Revolution; countless video games feature archery as an important skill or as a large component of the narrative, not to mention the influence of historical and literary figures such as Robin Hood or William Tell which are still very popular. Bows are prominent for a good reason. They are compact and powerful weapons that can be utilized cool and fun hobbies like target shooting and hunting. However, a bow is not just a bow. There are several types of bows and many different models with different features that are available nowadays, plus a lot of accessories such as stabilizers, quivers, and targets—it’s very easy to get confused in choosing the right one. In this article, we will focus on compound bows. We will explain what to look for in choosing the best compound bow, we will show a comparison table of top-rated and most popular compound bows, and we will provide you with best compound bow reviews. Our hope is that this guide will help you choose the best product for your needs, for your budget, gender and for your age. Compound bows differ from traditional longbows and recurve bows in an important way. The limb tips of the bow do not bend backward towards the shooter. In fact, the exact opposite occurs, the string and harnesses pull the limb tips towards the same direction. The limbs of the compound bow are also much stiffer in comparison to its other counterparts. This makes the compound bow store energy in a more efficient manner when shooting the bow. Furthermore, there is a pulley cam system consisting of wheels and strings that assist with shooting the bow, which recurve bows and longbows do not possess since they are a continuance of traditional designs whereas the compound bow is a hybrid of old and new technology. As mentioned above, compound bows rely on a pulley cam system (cams sometimes are referred to as eccentrics). There are four different pulley cam systems in modern compounds: Single, Twin, Hybrid, and Binary. 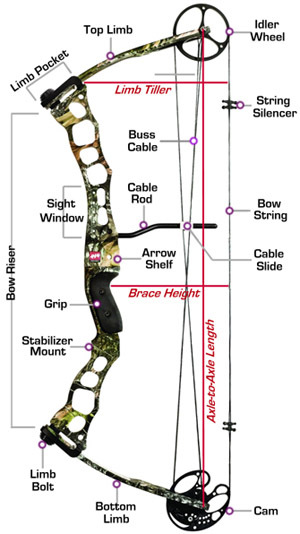 A single cam bow has one harness that pulls the limb tips in the same direction. Twin or two cam bows, however, have two harnesses that have the same function. Hybrid cams have two asymmetrical elliptical cams and they are interconnected to function together. Binary cams feature a free-floating system, which is essentially a self-correcting system that eliminates synchronization or timing issues for shooters. There are fans of all types of systems who claim that their preferred cam system is the best. In our view, essentially it all boils down to personal preferences. Additionally, you can add compound bow sights, arrow rests, and other accessories to improve the performance of the bow. Lastly, you need to pick a good release for proper shooting with a compound. There is a general misconception that one can only buy a good bow at a pro-shop. As with most industries in our technological age, it’s just not true – one can buy great bows online and have them delivered to a doorstep without having to drive to a store. Actually, close to half of all bows sold today are sold online. Yes, there are different bows that are sold online and in local pro-shops. No, they are not much different. Many manufacturers like to tout their flagship (often most expensive) product as being a ‘free speed bow’. They claim that it is silky smooth when you draw it, while it also fires at nearly speed-of-light velocity and without making any noise. This is, unfortunately, a myth – there is no a ‘unicorn’ compound bow. Higher performance on one element of a compound bow inevitable means that there is a trade off on another element. There is no singular compound bow that is the most novice-friendly, while also the quietest, most accurate and the fastest of them all. All bows have advantages or disadvantages that must be factored in and considered when purchasing the best compound bow. There are a few key characteristics that you should focus on when choosing the best compound bow: 1) speed 2) draw weight 3) draw length 4) let off 5) brace height and 6) your budget. Let’s go through them one by one. One of the main factors to focus on that when selecting a compound bow is speed. Speed is expressed with a Feet Per Second (FPS) and all compound bows have their measured FPS speed rating. To ensure consistency, the International Bowhunting Organization (IBO) standardized the approach to speed measurements. All bows are measured on the basis of 70lbs draw weight, 30” draw length and with using a 350-grain arrow. Naturally, if you are with any of these factors different from the standard, the resulting speed will be different. Generally, when you are choosing a compound bow you should aim for a bow with the highest speed. The faster the speed of an arrow when you shoot, the harder it is for your hunting pray to react to it. Also, the faster the speed, the harder the arrow will hit the target. Make sure you use proper hunting arrows for best results. To increase speed and the amount of energy from the stroke, it is best to shoot from a compound bow that has a high maximum draw weight. For instance, a compound bow that has a draw weight of 60 lbs will have a higher speed of the arrow in comparison to a 50lbs one. If you decide to hunt deer, a draw weight of 45lbs is the bare minimum needed, so most hunters opt for compound bows with a draw weight of 50-70 lbs. While higher draw weight does have advantages, it can also be a disadvantage. Although a high draw weight of the bow may result in a deadlier and quicker shot for your prey, if it is too high it can also lead to poor shooting techniques as it will be harder to control when drawing and aiming. To prevent injuries and enable proper shooting techniques it is vital to be able to hold the bow for a minute at least in full draw without shaking and also be able to draw the bow smoothly during the entire draw cycle. However, most compound bows allow for a 10lbs decrease from the maximum weight so that you can start with lower draw weight and increase it once your muscles get stronger from practice. The draw length of a compound bow is the distance between positions of the bowstring at rest and at full draw. Having the correct draw length in accordance to your own physical stature is paramount since you can never achieve your full shooting potential without having a properly fitted bow. The general rule of thumb in selecting a draw length is your full arm span divided by 2.5 as illustrated below. However, keep in mind that most bows have adjustable draw lengths. Another important factor to consider when purchasing a compound bow is the let off. The cams of the compound bow can be held at full draw while only utilizing a small percentage of the draw weight. Let off is calculated as the percentage of peak weight that you hold at full draw, so if your compound bow has a 70lbs draw weight and there is a 75% let off, then your full draw is around 17 pounds (ie you need to pull 17lbs to keep bowstring at full draw). There pros and cons to higher and lower let off. If you have lower let off then this increases the velocity of your arrow, whereas higher let off lets you hold the bow longer at full draw. Too much let off can lead to bad shooting form, however, it can be useful in certain hunting situations when you have to wait for a perfect shot. One more important factor that is crucial in choosing the best compound bow is the brace height. Brace height is the distance from the bowstring to the grip of the shooter. There is a direct correlation between how close the bowstring is to your wrist when it is at rest and how much physical exertion, or work, you must do to draw the bow back. Shorter brace heights result in more stored energy, thus resulting in increased arrow velocity. However, shorter brace heights, around 6.5 or less, are not recommended for novices since minor flaws in shooting technique are amplified in exchange for a shorter brace height. If you are a beginner, it is wise to start with the standard 7-inch brace height. Lastly, when choosing the best compound bow it is important to consider your budget. There are many compound bows for all types of budgets. However, one should keep in mind that unlike many other industries, when it comes to compound bows price and performance are highly and positively correlated. Patent royalties for use of latest technology, high-performance materials, the complexity of manufacturing – all these elements are factored in a price of a compound bow. The higher the price, the more advanced the bow is. With all of the above in mind, let’s take a look at the best compound bows available in different price ranges, starting with the higher priced bows. If you are also looking for the best bow for women, we have a separate guide here. Martin Archery Lithium compound bow is a powerhouse! It features a one-piece CNC-machined bridge riser which provides the ideal base for the durable and fast x4 twin limbs. The riser is solid and equipped with Martin Archery’s patented vibration escape system for a shock-free, smooth, and silent shot at 335 feet per second. This bow is lightweight, and combines excellent shootability, deadly speed, and stealthy silence, making it the perfect 3D and hunting bow. The sleek design on this bow features a 7-inch brace height, and 38 inches to 31 inches draw length adjustment. Axle to axle, the bow is 33.25inches. Draw weight is 50-70 pounds, and draw length is 26 to 31 inches. The bow weighs approximately 4 pounds. It is harnessed with fully adjustable Nitro 3 cams, x4 twin limbs, and the carbon STS. Martin’s carbon fiber STS system uses lightweight and rigid carbon fiber. This system pivots, extends, and is easily adjustable. It is the perfect vibration suppressor and will also fit most bows. The one piece riser means fewer attachments, making the bow even more stable. The Martin Lithium bow also includes a capture rest which fully captures and encloses your arrow while providing full vane clearance. This means there is no loss of speed or drag. The bow comes in several colors including Mossy Oak Break-Up Infinity and black. The dual arrow clips provide a secure option for holding your arrows and makes them easy to access and remove when it is time to use them. This bow is pricey, but well worth the investment because you will have a quality bow for years to come. Up next is the Bear Method bow, from Bear Archery, is their newly developed tool that grants its user strong, speedy shooting power and accuracy while remaining silent as a whisper. The power starts in the draw, with a half-inch adjustable draw length ranging from 25.5 to 30 inches, before modules are applied, to accommodate the user’s preferred draw power and ammunition. The bow releases at 75% let off allowing the user plenty of space and freedom to adjust aim and always remain on target. Its shooting speeds are rated by the IBO standards as fast as 350 fps, for an almost instant approach to the target, and the synchronized hybrid system ensures that with speed there comes power enough to bring down even the largest game or target. The Method comes with 6-inch brace height, which is not very forgiving for beginners, but will serve archery veterans with a good shot and those eager to improve their skill level. Finally, with the sound suppressor that it shares with its predecessor, the Motive 6, the entire process of draw and release stays absolutely quiet, allowing the user to maintain cover and prepare for the next target. The Bear Method is the only model in its class of compound bow where each of the main features can be found together, bringing it in, with accuracy, power, and speed, at a notch above any of its competition in this price range. All Bear Method reviewers ranked the bow very extremely highly and were very happy with its performance. The PSE Surge Compound Bow is one of the best bows for beginners because of its easy learning curve and relatively simple mechanics. Because the PSE Surge is so well made, it can serve as a tutorial for the novice bowstriker when he or she wants to get involved with more specialized bows. Many novices should jump at the chance of obtaining a PSE Surge and they will love it. The Surge is a dual cam compound and it is quite a high-performance weapon, especially for being such a forgiving bow. At its great price, this model has a high registered IBO speed of 312-320 fps and thus delivers more speed than most of the other dual cam compound bows. This speed will work well for target shooting as well as to hunt small to medium sized game. The Surge boasts a very manageable compact 32-1/2” axle to axle brace height along with an incredibly forgiving 7-1/4″ brace height. The maximum draw length of the Surge is 30 inches and the draw weight is 70lbs, with a let off of 70%. Sinister is made of incredibly light aluminum that gives it ability to be carried by people of all statures and ages. Its large cutouts also relieve a great deal of weight that other bows carry around needlessly, so it is quite lightweight. Overall, this is a highly recommended model for beginners, it is a high performer, versatile and comes at a great price. Plus, one can’t go wrong with an iconic PSE. For the most budget conscious, the Diamond Infinite Edge Bow is quite the bargain. The bow is a versatile piece of equipment that is perfectly suited to both sexes and archers of all ages. The widespread on this bow allows an individual to tailor it to their strength level. The adjustable draw length is 13 to 30 inches, and the dual cam bow can release an arrow at a velocity of 310 feet per second. The kinetic energy packed at such speed will be enough for any target shooting and will also do well on smaller game and deer. The Diamond Infinite Edge Compound Bow is suitable for both right and left-handed shooters. The bow has a max draw weight of 70 pounds. This is the average draw weight for a large man, but it can also be adjusted to small weight to fit a young adult or a female archer. The design of the Diamond Infinite Edge Compound Bow is aesthetically pleasing, and it integrates a string stop with a great camo covering. The Diamond Infinite Edge Compound Bow has a let off of 75%, and the bow is extremely adjustable for shooters who like to experiment with their equipment. This is one of the top value bows on the market today, and it allows an archer to learn the craft before moving onto a less adjustable setup. Great choice if you look for a great and reasonably priced compound bow and definitely the best model in its price range. This bow is wonderfully suited for all ages and skill levels – young adults and beginners as well as experienced archers. It is an especially good choice for novices since it has light draw weights and covers a wide range of draw lengths. Purchasing the bow is easy because specific measurements are not needed for draw length. Beginner archers will benefit greatly from zero let off as it will help them to develop proper technique from day one. Higher let offs are more forgiving to improper form, so it is important to get technique and form to a high level before upgrading to more advanced compound bows. The Genesis Original Bow’s status as the best choice for younger archers is validated by the fact that it is the official bow in the National Archery Schools Program. The bow is widely used in most young archers’ competitions, both national and international. Made from high-grade aluminum, the Genesis gives optimum balance, durability and it is very lightweight. The bow comes with a molded ergonomic grip for competitions. The Genesis bow features single cam technology which means no tuning is required in the long run. Single cam technology also means that accuracy is greatly increased and noise is minimalized and there is very little recoil. When the draw weight is set at maximum, this bow stores and releases energy comparable to a 35 pound recurve bow. In our editorial opinion, the Genesis Compound bow is a great bow and a great buy for everyone interested in learning archery. Overall, the best beginners compound bow in 2016. I am looking for a bow. Pushing 350. Ibo. Or. Fps. 70 lb or better. 31 in draw. Link. Arrow. I want a fast. Bow. if i hold the bow in my left hand and release from my right hand this make me a lefty, right? Looking to buy a new bow for hunting and just like to know what you think about some of the best to buy to hunt with ? There so many brands out there it’s hard to know what is the better or the best ! Thanks for the help ! By the way I been hunting for 30 years so it ain’t like I am a rookie ! Russ, with compound bows higher prices does mean better performance, so it comes down to the size of your wallet, in a way. The bows we listed here all great for their price range, so I’d recommend choosing one that is within your budget and enjoy the hunt! I’m looking to get back into bow hunting. I used an original Bear Whitetail II, back in the day. I still have the bow, but because of the materials in the riser, I’ve always been told not to drill and add accessories. I know other bows have had flaws/growing pains as well. I had access to a Mathews SQ2. I loved shooting it, but true to it’s design, it ate strings. In looking for a new bow, I’ve read several review sites to compare bows. Yours has been the most helpful so far. I’m seeing the Diamond Infinite Edge on almost every review. Is it really the bang for the buck that it appears to be, or has time revealed some ugly flaws? I just don’t want to spend money on something that isn’t going to last. I want to purchase a bow that I can hand down to one of my boys later.